The purpose of this work is twofold. First, I would like to encourage those of you who are not makers, to construct a violin of your own; and secondly, I would attempt to document the methods and techniques of violin making as used today. By this I do not mean that the old "tried and true" methods of the masters will be neglected or bypassed, not at all; the basic techniques remain the same, however the great advances in modern technology and science have given us new tools to work with, and we will use them. Modern makers are a new breed; they are not content with just going along with the old established methods, they are staying with the scientist and learning to use the tools of the scientist to make a better violin. To those who have never made a violin, I should suggest that even though you might be a player and enjoy playing the violin, you have yet to enjoy this pleasure to its fullest extent. To play on an instrument that you have built yourself, even if only of fair tone, will provide the greatest thrill of all. Even if you are not a player, to make a violin and then to hear it played by a master, can really get to you. Violin making brings contentment, it helps one to relax, it teaches control of hand and mind, it brings excitement. As the work progresses towards completion, the urge to play and to hear your creation becomes overpowering. 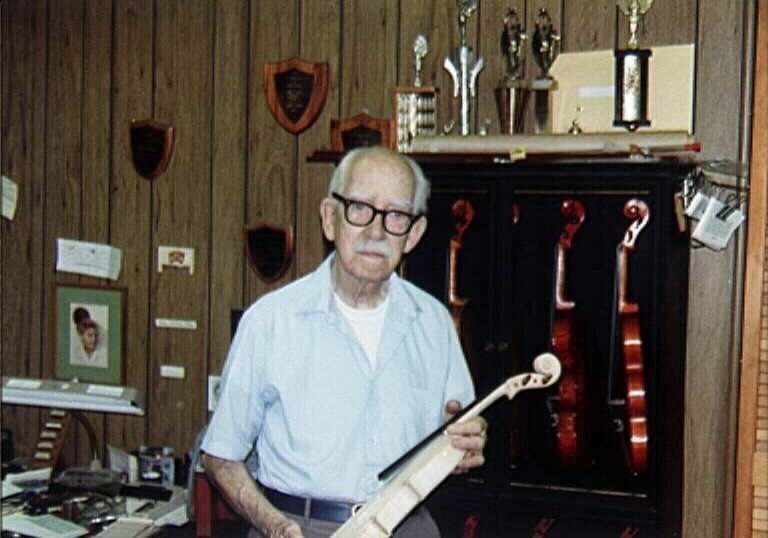 You will never grow old if you take up violin making. It is suggested that the prospective violin maker start with just a few simple hand tools and that others be added as the work demands. As for power tools, you will find a bench type drill press very useful and likewise a bandsaw, however as mentioned above, you can purchase these as the need arises. Write to a few music supply houses for catalogs, look over the violin making tools and materials and order what you need to get started. Most important, get a nice piece of well seasoned maple for a fiddle back, and spruce for a top. Get matching maple for the sides and a block of the same material from which to cut the neck and scroll. In presenting this volume, the author hopes that in some small measure he will encourage the continued development of the art of violin making, and who knows, perhaps bring to light some unknown talent who may be a future Stradivari. From his book, "The Technique of Violin Making."